New page for Alfred Stephens. New pages added for Thomas Aldridge, Henry Daysh and the Gerard family. Gardner updated due to links with the Aldridge family. New pages created for Bernard Elliott, Samuel Guppy, and Thomas Ringrose. Updates to Baskfill page with new research, and updates to Libby page with new information from descendent Emily Herd. Robert page updated with new information from descendent Joan Stratton. For a full list of all the butchers families featured here - see Butchers. This site is dedicated to the family histories of butchers in Guernsey during the 19th Century. Many of them were immigrants from the south coast of England - particularly, Devon and Dorset - attracted by the growth in population and trade during this period. They established close links with each other and formed a strong community, with many connections between the families. On the Butchers page is a list of all of the butchers I have come across in island censuses, trade directories and other sources. The Maps page shows where they came from in England and where they settled in Guernsey. I am adding to it regularly, so if there is anything you want to know, or anything you have to share, please get in touch. Further details of the sources I have used, are listed on the Sources page. Much of this will be relevant to anyone researching the history of their butcher ancestors in the United Kingdom. The Links page includes suggestions for further reading as well as links to other sites of interest. Up until the late 18th century, the island was largely self-sufficient, with the protein in their diets coming from a combination of freshly-caught local fish, pork (most households kept a pig or two) and beans (as in our traditional beanjar). With the threat of a Napoleonic invasion, came a dramatic increase in the size of the army stationed at the island garrison. In order to accommodate the extra mouths to feed, cattle were imported to the island, initially from the ports along the south coast of England, such as Lyme Regis, Dartmouth and Brixham. The picture on the right is of Rue des Vaches (Cow Lane) - the original site of the meat market in St Peter Port. 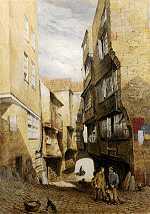 This lane connected the High Street with the Harbour. Cattle arrived on ships, and were herded up the beach into this lane where they were slaughtered. At high tide, the sea washed away all the blood and offal. In 1777, a private company was established which bought a field from the St Peter Port rectory garden, just behind the Town Church, and 1780 they built a market there in which to house the butchers. 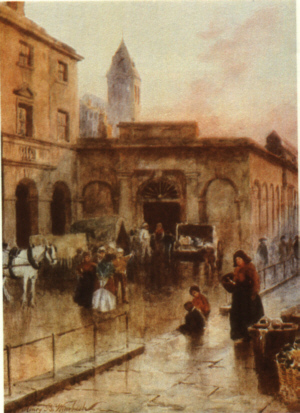 This building became known as the French Halles or Leadenhall market. In 1818, the States of Guernsey acquired the market, and in 1820, began construction of a new market building to house the butchers. The building was designed by John Wilson, architect of a number of acclaimed public buildings in Guernsey, and was completed in 1822 (see right). As the threat of Napoleonic invasion subsided, the island prospered, and the nineteenth century saw a boom in growth of the civilian population. This brought further challenges of feeding the island. But England was in a similar situation, and so the island butchers had to look to France and Spain for cattle to import. The growth in demand attracted even more butchers to the island. The same period saw increasing regulation of the meat trade, as the understanding of the links between food hygiene and public health became better understood. This led to the introduction of a central abbatoir and the eventual introduction of Meat Inspectors by the Board of Health in 1908.